Russia's hybrid military forces attacked Ukrainian army positions in Donbas 75 times in the past 24 hours with two Ukrainian soldiers reported as killed in action (KIA); the situation in the area of conducting the Anti-Terrorist Operation (ATO) remains unsettled, but controlled by the Ukrainian Armed Forces, according to the press center of the ATO Headquarters. "In the Mariupol sector, Ukrainian positions near the village of Mykolaivka came under fire from artillery systems of large caliber, while the militants used mortars in the villages of Slavne, Hnutove, Pavlopil and Berezove. The enemy also fired small arms, machine guns of large caliber, and grenade launches of various systems on the villages of Shyrokyne, Vodiane, Talakivka, and the town of Krasnohorivka. The occupiers also used infantry fighting vehicles and a tank to attack the towns of Maryinka," the ATO HQ posted on Facebook. Read alsoMilitants down OSCE SMM’s drone near Donetsk filtration plantTwo Ukrainian soldiers were killed in a military clash with an enemy subversive reconnaissance group. In the Donetsk sector, the Russian occupation forces opened fire from mortars on the Ukrainian positions near Butivka coal mine, and the villages of Luhanske and Nevelske. The enemy also fired machine guns, grenade launchers, mortars, and a tank on the Ukrainian positions near the town of Avdiyivka. 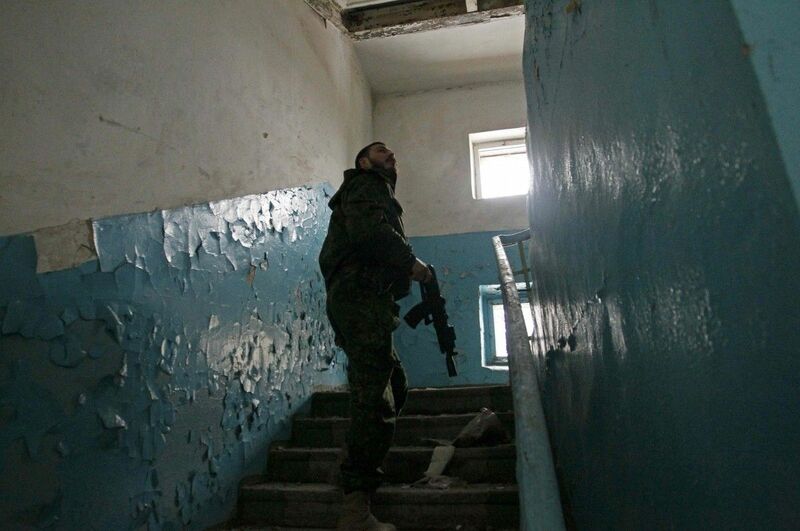 Read alsoUkraine reports 108 enemy shellings in past 24 hoursIn the Luhansk sector, the militants opened fire from mortars on the Ukrainian positions near the villages of Katerynivka, Bohuslavske, Novo-Oleksandrivka and the town of Popasna. The village of Valuyske came under fire from small arms and machine guns. As UNIAN reported earlier, the militants shelled the pumping station of the first elevation of Yuzhno-Donbasky water pipeline on Saturday night. The station is located between the villages of Vasylivka and Kruta Balka near the contact line. It provides water supply to Volnovakha, Pokrovsk, and Dobropillia regions, as well as the city of Mariupol.